“I am a daily wage worker. I earn Rs.300-500 a day, on days when I find work. We have never felt that this amount was insufficient to keep us happy. My children are also very understanding. 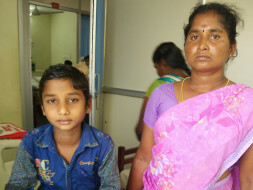 They understand all our hardships and help us a lot, but when you mention a sum in lakhs and tell me that’s what I need to give to save my son’s life, my hands and feet would obviously tremble, and I would stand helpless, like I do today,” Rithick’s father Shaktivel tries to explain his situation. 9-year-old Rithick was a brilliant student. He enjoyed learning new things. For his father, it was a matter of great pride to be called to school by the Principal to be told about his son’s excellent performance and beautiful handwriting. However, he had to discontinue school after his 3rd standard. It began there, weekly visits to Madhurai, and regular check-ups. Shaktivel has been sitting with his family, outside the ICU for the past 2 months. His daily wages do not come in anymore. 6 months back, they had received some money from CM Relief funds towards Rithick’s treatment, but that is also almost over now. After this, they cannot even afford a day’s expense on their own. 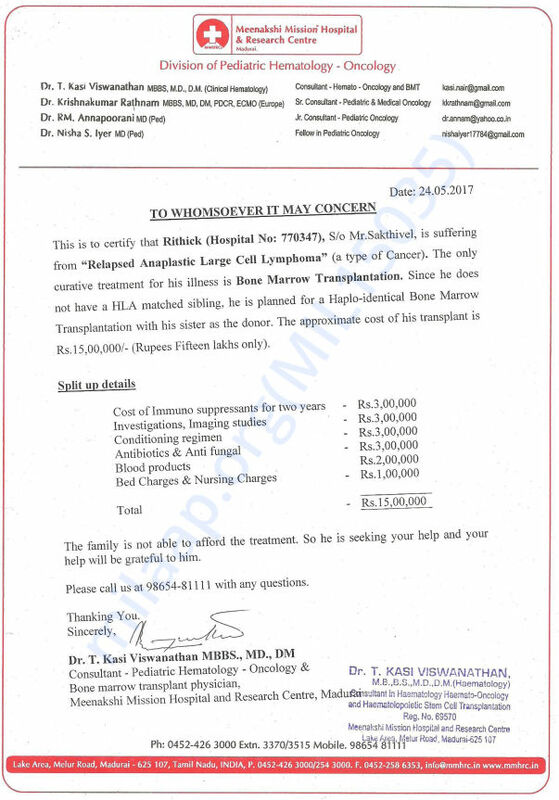 Rithick needs an urgent Bone Marrow Transplant to save his life. This would cost the family around 15 Lakh. He cannot survive without it. As time is quickly passing, his condition is worsening. On the other side of the ICU door, the family is desperately praying and banking on your kindness to see the little one come back to life again. Your support can give Rithick a second chance in life. Here is an update on Rithick. He relapsed Anaplastic Large Cell Lymphoma. He underwent Haplo-identical stem cell transplantation. His sister donated for the same, the transplant was successfully done. He is day five months post-Haploidentical Bone Marrow transplant and is currently doing well. Thank you for supporting Rithick and his family in their time of need. Prayers & best wishes for your son ! God bless you and recover fast champ!